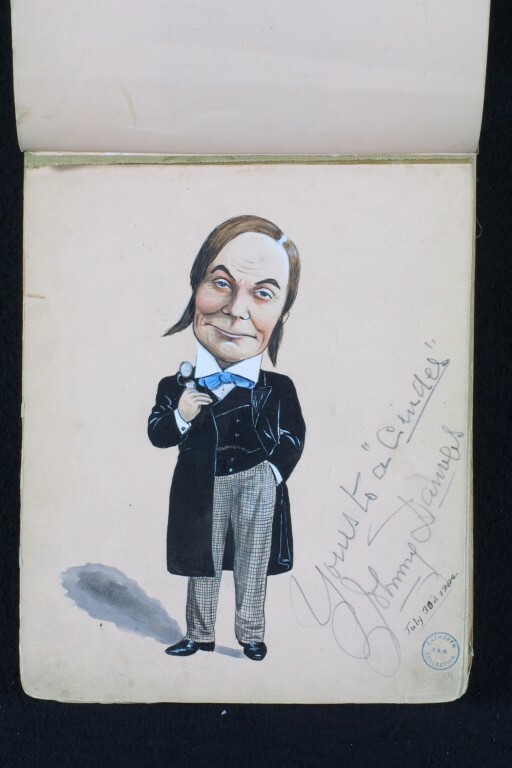 This caricature is of the Yorkshire comedian Johnny Danvers when he was performing at Collins’ Hippodrome, Stoke-on-Trent, during the week of 25 July 1904. It is one of the many superb caricatures of Edwardian music hall performers that were drawn by the artist George Cooke when he was based at the Grand Theatre of Varieties, Hanley. He compiled them in a series of albums. Although younger than the famous performer Dan Leno, Johnny Danvers was Leno’s uncle. As boys they ‘busked’ together on street corners and outside pubs. Danvers made his first stage appearance as a boy at the Alexandra, Sheffield. He later joined the Moore and Burgess and Mohawk Minstrels, becoming its leading comedian. He was in musical comedy with Seymour Hicks and made his last appearance in London at the Oxford Music Hall. He always began his songs by grinning broadly and running his fingers through his hair. Johnny Danvers appeared with Dan Leno several times in pantomime at Drury Lane in London. Pen, ink and wash caricature on pink paper of Johnny Danvers, full-length, his left hand in his pocket, wearing a black frock coat and waistcoat, a blue bow tie and checked trousers. This caricature is of the music hall comedian Johnny Danvers performing at Collins' Hippodrome, Stoke on Trent, during the week of 25 July 1904 when he was one of the supporting acts along with The Fitzroys, the aerial gymnasts, and Ginnett's Fiery Untamed Steeds. Topping the bill was 'Millie Hylton, direct from the Oxford, Tivoli. Metropolitan etc.' The programme was advertised as featuring 'Johnnie Danvers of Drury Lane fame. "Johnnie" who has for years past been the Principal Comedian of the celebrated Moore and Burgess and Mohawk Minstrels, now introduces his 'White Face' Entertainment.' It comes from the first of several albums compiled by the graphic artist George Cooke when he was based at the Grand Theatre Hanley, featuring performers working in music halls in the early 20th century. The album is dated 1903-4-5. 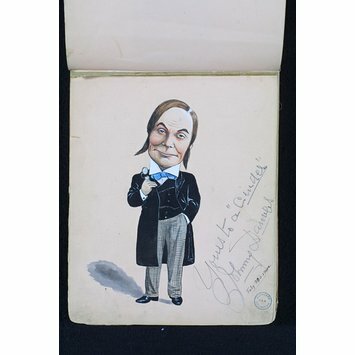 Caricature of the music hall comedian Johnny Danvers, from an album of caricatures drawn by George Cooke. July 1904.